The mines, machinery, and trucks of the Alberta Tar Sands were the inspiration for Avatar’s Edmonton born art director’s vision of the mining operation on Pandora. 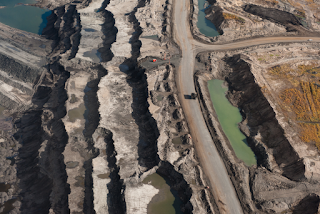 One of the biggest ecological disasters of this century is the strip-mining of ancient boreal forests in Canada in order to mine the tar sands of the Alberta region. This is a view from GoogleEarth: the land stripped is the equivalent of the area of the state of Florida. Naomi Klein is a Canadian author and social activist known for her political analyses and criticism of corporate globalization. Huge mines here turning tarry sand into cash for Canada and oil for the United States are taking an unexpectedly high environmental toll, sucking water from rivers and natural gas from wells and producing large amounts of gases linked to global warming. The digging has proliferated at gold-rush speed, spurred by high oil prices, new technology and an unquenched U.S. thirst for the fuel. The expansion has presented ecological problems that experts thought they would have decades to resolve. "The river used to be blue. Now it's brown. Nobody can fish or drink from it. The air is bad. This has all happened so fast," said Elsie Fabian, 63, an elder in a native Indian community along the Athabasca River, a wide, meandering waterway once plied by fur traders. "It's terrible. We're surrounded by the mines." From her home on the bluff of the river, she can see billowing steam rising from a vast strip mine 10 miles away. There, almost 200 feet below what was once a forest, giant machines cleave the earth into a cratered moonscape. Immense shovels plunge into the ground, wresting out massive chunks. Trucks the size of houses prowl the pit. They deliver the black soil to clanking conveyers and vats that steam the tar from the sand. The miners have created a marvel of human industry that takes a spongy muck once considered worthless and converts it into oil for gasoline, diesel and jet fuel. But the price of that alchemy is high: Each barrel of oil requires two to five barrels of water, carves up four tons of earth and uses enough natural gas to heat a home for one to five days, according to the industry's own calculations. "The environmental cost has been great," said Jim Boucher, chief of the Fort MacKay First Nations Council, which includes Cree and Dene Indians, 35 miles north of Fort McMurray. He grew up on land that is now a clawed-out mine pit. But he has led his people into the mines by creating native-owned companies providing catering, truck driving, surveying and other services. "There is no other economic option," he said. "Hunting, trapping, fishing is gone." Operators of the mines, which have helped make Canada the largest supplier of oil to the United States, believe they can find technological solutions to the environmental problems. The oil companies point to steady reductions in the amount of water and natural gas used to produce each barrel of oil, for example. But those efficiency gains have been wiped out by the rise in the number of barrels produced. Increasingly, environmental organizations are calling for a moratorium on the growth of the mines. "We shouldn't be issuing new permits. We are foreclosing our future," said Dan Woynillowicz, who headed an extensive study for the Pembina Institute, an Alberta-based nonprofit that conducts research on environmental issues. 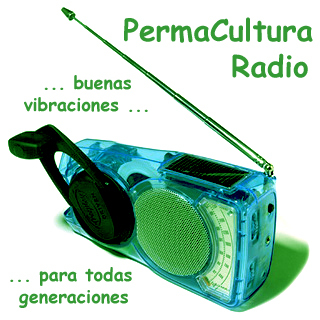 "In the 1990s, we acknowledged environmental challenges would occur. But we are 17 years ahead of schedule." When the oil sands became recognized as economically viable in 2003, Canada suddenly emerged as holder of the world's second-largest oil reserves, behind Saudi Arabia. 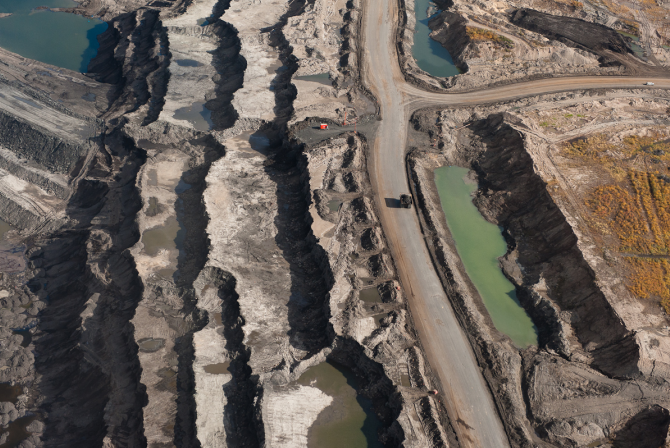 By 2015, according to industry forecasts, the oil sands will account for at least one-fourth of North America's oil production. Other countries are eyeing the wealth; China has invested in two mining companies and a pipeline to move oil from Alberta to shipping ports on the Pacific. As technology and ever-bigger machines reduced the cost of extracting oil from the sands, private companies rushed in, investing nearly $100 billion in mines and sprawling processing plants. They were expected to produce 1 million barrels a day by 2020. That goal was passed in 2004, and the companies are racing to double the output soon and triple it by 2015. They dig out shallower seams and inject steam underground to liquefy and pump out the deeper sands. Heating the water and processing the crude bitumen — a heavy, viscous oil — produces carbon dioxide, a greenhouse gas that is linked to global warming. 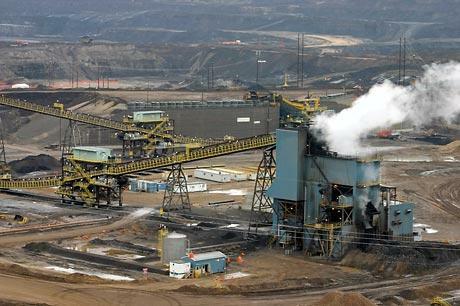 The oil-sands mines have become the largest contributor to Canada's increase in greenhouse gas emissions, according to Pembina's research. "If you grow production of the oil sands, you are going to grow greenhouse emissions," Ruigrok said. The oil companies are mulling ways to capture and bury carbon dioxide. Environmentalists want the companies to offset their greenhouse emissions by paying for conservation or alternative-energy programs. Shell Canada has agreed to fund such programs to compensate for part of its carbon emissions. But oil-company executives say that if their production is curbed, the world will buy the oil from worse polluters. Critics also question the wisdom of using natural gas to heat and upgrade the oil sands. "We are taking a cleaner energy source and turning it into something that produces a lot of emissions when you produce it and when you burn it," said Dale Marshall, a climate-change policy analyst with the David Suzuki Foundation in Ottawa. Those processes are "putting unacceptable pressure on the environment," said Julia Langer, director of the global threats program of World Wildlife Fund-Canada in Toronto. They point to threats to the Athabasca River, which flows from the Columbia Icefield in the Rocky Mountains. It tumbles through cool evergreen forests, wends through Alberta and finally joins the Peace River near Saskatchewan to form a teeming delta that is a major North American intersection for migrating birds. 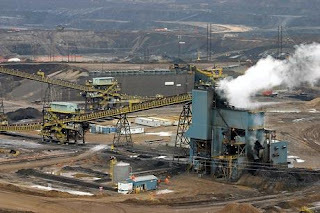 Mining operations have been permitted to take twice the amount of water from the river than is used annually by Calgary, a city of 1 million people, according to Pembina. Native communities on the river say further reductions in the low winter flows will make the river unhealthy and that the northern pike, walleye and burbot may not survive. And they believe the waters have been contaminated. Native residents of Fort Chipewyan, a village of 1,200 on the shores of Lake Athabasca, have experienced abnormally high rates of rare cancers. Industry officials say they do not pollute the river, and instead reuse the water they take as often as 17 times. The leftover emerges as a black, foul liquid collected in tailing ponds. The ponds have grown; one dam is among the largest in the world. The mining companies fire propane cannons to scare away migrating birds from the toxic waters. Industry officials say they are confident they will find a way to cap the ponds and solve the other problems. "I don't think there is a silver bullet that is the single answer," said Greg Stringham, vice president of the Calgary-based Canadian Association of Petroleum Producers. "But there are five or six technologies that are promising." The mines are being carved out of Canada's vast Boreal forest, a continental swath of timber and wetlands that ecologists say helps reduce global warming. From her 25-foot-high perch in the driver's cabin of a Caterpillar 797, the world's largest truck, Michelle Noer acknowledges that the landscape of Syncrude's Aurora pit mine "looks pretty rough right now. "If we just dug it up, I probably wouldn't be able to do it," said Noer, 37, who came from lush wine country in British Columbia for the work and high pay. "But we do reclaim it. And we do need the oil." One of the early Syncrude mining sites to be reclaimed now boasts 40-foot jack pine and spruce trees and songbirds that flit over hiking trails. "Beware of the Wildlife," a sign warns. "It doesn't look bad. But it certainly isn't Boreal forest," said Pembina's Woynillowicz. "We have to wait and see if this ecosystem they have put back actually is going to be sustainable." Water depletion, exploitation, privatization and contamination has become one of the most important issues facing humanity this century. Check out my other video on water issues: http://www.youtube.com/watch?v=XMmpg35Bym0 and see my other videos to learn about the dark side of fossil fuels. To learn more about tar sands, be sure to check out the featured film sources listed below. Find out more about what you can do and how to support the film makers. Tar sands development can be minimized by blocking development of pipelines, such as Keystone XL, that carry the sludge of this incredibly polluting energy project. Tell Canada to clean up this mess and join with Bill McKibben and Josh Fox and let your voice be heard. A visual journey through the Alberta Tar Sands and a discussion of the the local regional and global impacts and how we can respond. In Fort McMurray, Alberta, huge mines turning tarry sand into oil are taking an unexpectedly high environmental toll. Tar Mine and truck #4. Alberta Tar Sands 2010. 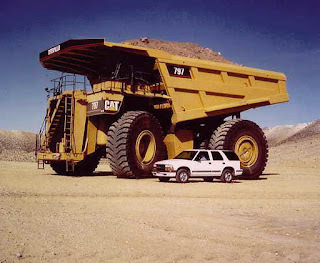 At the edge of an 80 meter deep mine, a massive tar sands truck is dwarfed by the surrounding landscape. 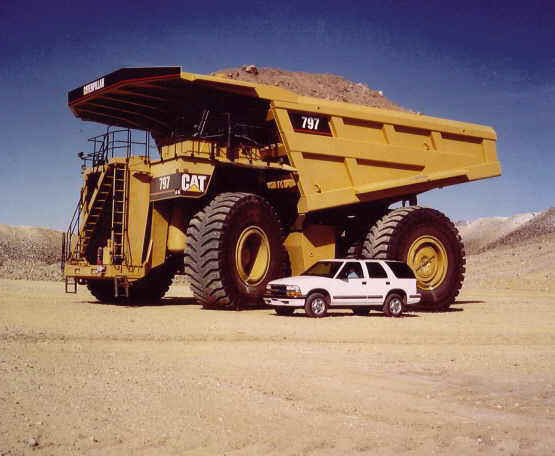 These 400 ton trucks are the world’s largest measuring 25 feet high, 47 ½ feet long, and 32 feet wide.